Where do you find artistic inspiration? 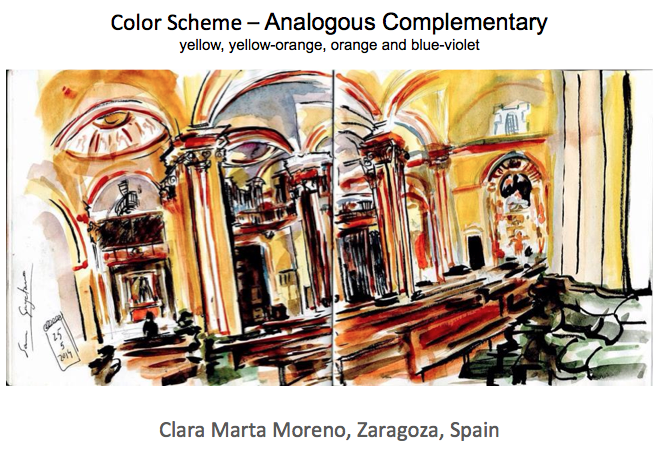 How do you pick the perfect sketchbook, pen, watercolor palette, or travel sketch kit? Looking for books on Urban Sketching? (Yes, there are books on urban sketching. In fact, many of them, filled with incredible sketches from all around the world). How do you connect with the global sketching community? Whether you are a veteran sketcher or completely new to urban sketching, this post will introduce you to all of the different ways that USk Chicago uses social media, outside of the Facebook group. USk Chicago has a blog, Twitter, Instagram and Pinterest account. Each account is used in a slightly different way to help you develop your skills, provide you with resources, and connect you to our local and global sketching communities. As an artist and urban sketcher myself, I have found social media extremely beneficial to my artistic growth. I use social media on a daily basis. I encourage you to read below for a brief introduction to the accounts, a brief summary about what each account is used for, how to use each account, and how your participation with them can help create “buzz” for our Chicago community and for this summer’s Sketch Seminar. If you are reading this, you've found our blog. This blog is managed and regularly updated by several contributors from our group. 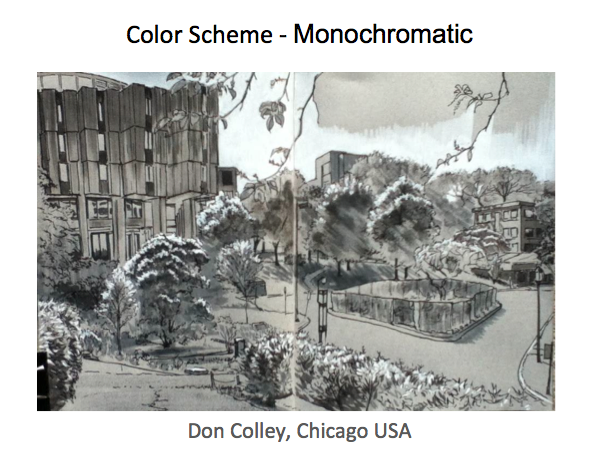 If you are new to the group, this is the perfect place to learn about Urban Sketchers, find contact information, learn how to participate with our Chicago chapter and read several of our ongoing series of posts. -TTT (Tuesday Tips and Tricks) – This is the newest addition to our blog. Each Tuesday we post a new tip related to sketching. -Sketchcrawls – After each sketch meet, we post pictures and a short re-cap from the event. Twitter is a short form blog where users make posts called "tweets". Tweets are 140 characters or less. Users can be followed by other users, and can follow other user's tweets. When someone you follow posts a tweet, it will show up in your news feed and vice versa. A re-tweet shares another user's tweet with your followers. For example, USk Chicago could re-tweet one of your tweets like the ones above. 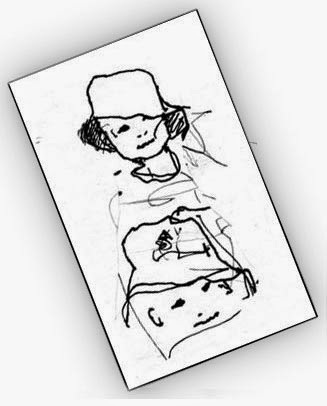 If you have a personal sketch blog and we follow you on twitter, once you announce a new blog post, USk Chicago can re-tweet your tweet announcement. Hash tags make your post searchable and will create buzz and increase readership for you and USk Chicago. When a hash tag is placed in front of a word, that word is sent to a virtual pool of search terms that can be viewed by anyone searching for that word. Instagram is another type of short form blog dedicated to posting and viewing photographs and short video clips. Unlike Facebook where you can make folders to organize images, an instagram account hold all of your photos in one location. You can be followed by other uses, and you can search for people to follow. Several USk Chicago members have already started using Instagram and share their sketches here. Hash tag your posts with #USKCHICAGO (and other sketching related tags) in the caption. Mention USk Chicago in your post with @USKCHICAGO. This notifies USk Chicago that you made a post related to USk Chicago. Follow "USkChicago"Pinterest is essentially an electronic bulletin board. USk Chicago's Pinterest account is filled with different sections (called "boards") where several of our administrators regularly pin and re-pin everything urban sketching related. For example, USk Chicago has a board called "Books We Like." Here we pin books related to urban sketching and art techniques. Another popular board is the "Sketching Tools" board. Here we post all sorts of ideas of different pens, paints, paper. The highlight of this board is all of the creative sketch travel kits that people create. There are tons and tons of ideas to help you research and investigate all of the different "sketching tools" there are to chose from. Some of the other boards we pin to are "Urban Sketchers Global," "Urban Sketchers Chicago," "Tuesday Tips and Tricks," "Hints and How to's, and "On the Road Sketching." download the Pinterest App on your smart phone or use on the computer. Follow Urban Sketchers Chicago's boards. Every time USk Chicago adds a new pin to one of their boards, it will also show up in your news feed. If you like the pin, you can re-pin it to one or your own boards. Create a board with you own urban sketchers. Let us know that you have an account so we can begin to follow you and re-pin your sketches. Pinterest rewards activity. Images, repins, likes and comments affect where images appear and the amount of exposure they get. Images with a title are more likely to be repinned. More followers=more power. If you are completely new to our community and to these social media accounts, I hope you find this post helpful. Please comment below or email us with any questions you have at urbansketcherschicago@gmail.com. We will be more than happy to answer questions or help you get set up. This TTT post is a continuation of the Color discussion we have started last year. This is Part 2. Here's Color - Part 1 post, if you want a refresher. Let's talk about color schemes. If you leaf through your sketchbook, you will likely note the similarity of colors on your various sketches. We tend to find something that works for us, satisfies our aesthetics to some degree, and we then run with it. How can we expand our vision on colors, get out of out boundaries of habit? Regardless of the media we use - paint, markers, color pencils - we can use the logical relationships of colors on the color wheel to control and expand our palette. This is where basic color schemes are helpful. Color schemes are based on color similarities or differences, and usually feature a dominant color. 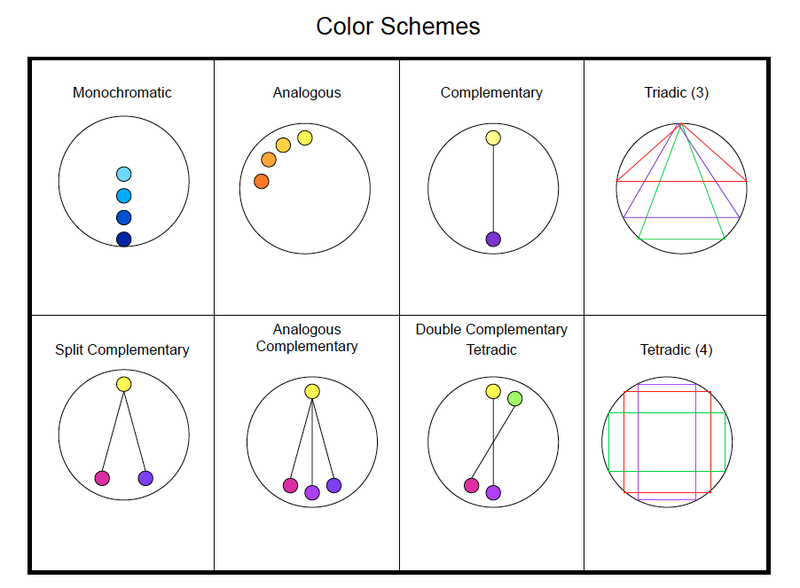 Color schemes based on similarity are monochromatic (one color in different values) or analogues (colors that are neighbors on the color wheel). Color schemes based on difference are composed of complementary or triadic relationships, they are opposites or triangles on the wheel. An exception is a pure color contrasted with a neutral – white, gray or black. I will give an example sketch for each of the 8 color schemes here. Note how much variety of middle tones Don uses in this sketch. This variety give the image richness even though it is monochromatic. This is my sketch, I use an analogous color scheme from dark red-brown through orange to yellow. This set of colors creates harmony. One speck of green punctuates this harmony, but we will discuss this in the next chapter. Complementary color schemes usually have an added benefit of simplifying the image, like here a fairly complex market scene appears calm and relaxed. 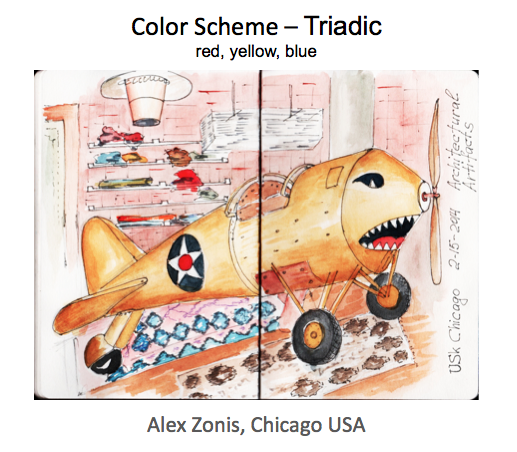 Many have seen this amazing yellow plane at Architectural Artifacts at our sketch crawl. 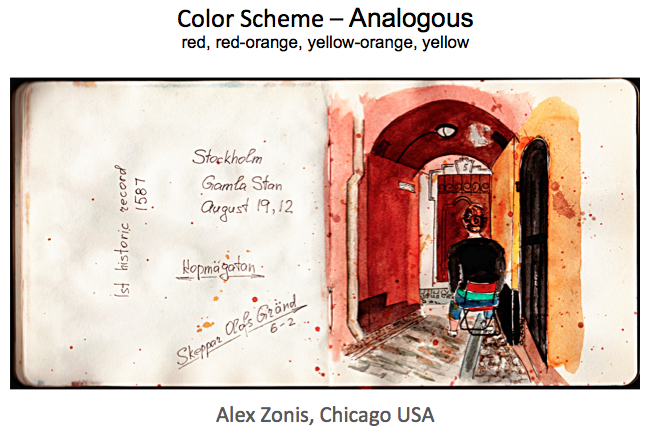 What makes this sketch successful is its pure Triadic color scheme executed in primary colors. Yes, I made the brick wall more red and designs on the rug more blue to make the triad more obvious. An interesting variety results when we can split a complement into two colors. The image become richer and more complex. Notice how yellow, yellow-orange and orange are balanced out by blue-violet shadows and recesses give the eye a resting point. 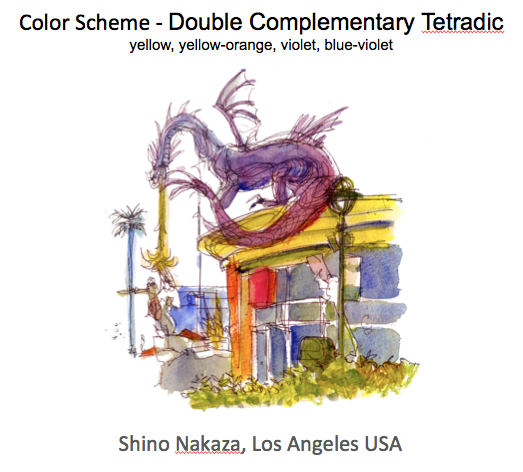 In my color class I find that this color scheme - double complementary tetradic - seems the most puzzling for students. That's until they realize that this is just two pairs of complements that are adjacent or next to each other on the color wheel. Like here: yellow and violet is one pair, and yellow-orange and blue-violet is the second pair. That's all there is to it, complicated name non-withstanding. See how the main colors of this sketch red-orange, yellow, blue-green and violet are positioned on a color wheel. They form a rectangle, this makes it a tetradic color scheme. 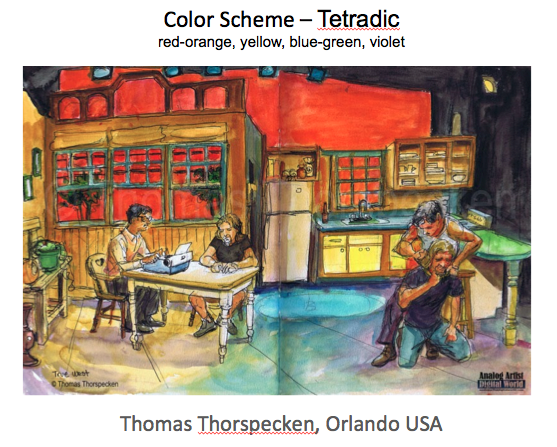 Tetradic is a well balanced scheme, and this quality can be used in composition. 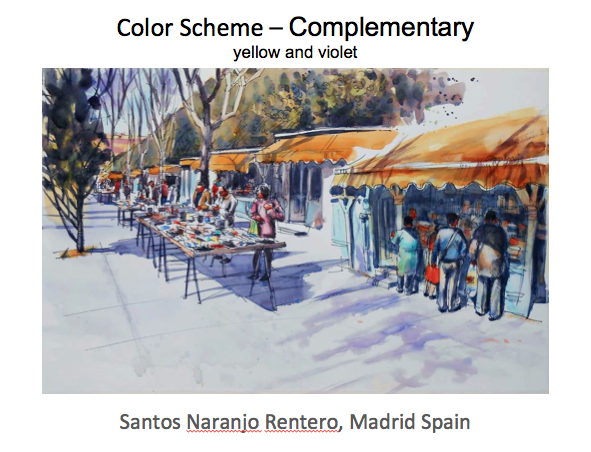 I invite you to practice color schemes to get familiar with them. Draw a sketch with each one of them. If it is an Urban Sketch, share it with us on our Facebook group. If not, just use it as an opportunity to practice. Our next color topic will be Contrasts! See you then! A photo flip sketch done after studying the photo for about 10 seconds. Let’s face it almost all drawing is, in a way, memory drawing. Whether it’s a past vacation vista or the second it takes to look from your subject to your paper, it’s your mind’s eye holding the image for you to draw. The trick is to develop that eye to keep the image true while you transfer it to the paper. The tip is to do memory exercises – the sharpen your memory the better your drawing. Here are a few games to get you started. You can use a photograph or an image from a magazine or newspaper. Choose something in the photo that attracts you. Study and simplify your chosen image carefully but quickly, twenty seconds tops. Now, flip the photo over and draw what you remember. Try it again with the same photo, this time study it for ten seconds. How much more did you remember? "Try not to remember merely the position of the model, just as when you memorize a poem you are not just trying to memorize just the shapes of the letters." Go to a cafe. Choose someone to draw. Observe them carefully. You won’t be able to control the amount of time you have since they will move. You can count on that! Now draw what you remember. Wait a bit and you’ll find they’ll return to the same pose again and again. Draw them again. And again. How do your sketches compare? While your waiting for them to return to the same pose choose another subject and use the same techniques. Not done in a cafe but in a park watching my granddaughter play. Rather than do a new sketch for each observation in these exercises try them by drawing over/correcting your original sketch. 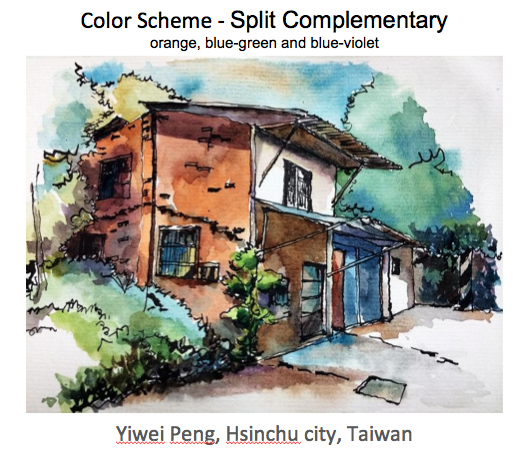 Powerful observational skills and a strong visual memory are a tremendous skills for an Urban Sketcher who shares a view of a fast moving world. 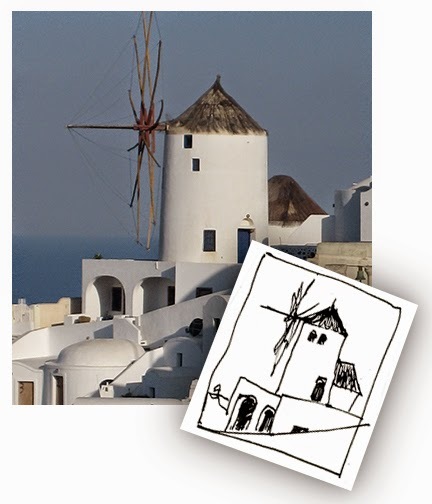 Practicing observation and memory skills will improve your on location sketching. 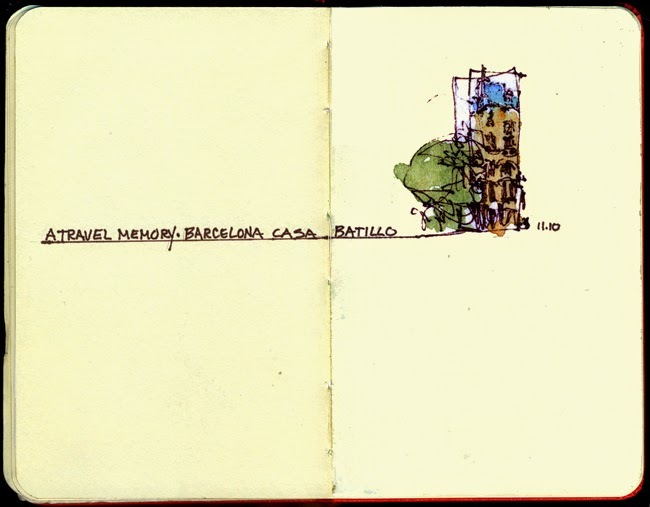 I call this a memory doodle, done totally from a memory of Casa Batillo in Barcelona. Did your reaction change at all? Of course I am hoping that your reaction was a positive one. It reminds me of my favorite fairy tale by Hans Christian Andersen called "The Ugly Duckling." When I chose to sketch this gas meter, I must have passed it a hundred times to and from picking up lunch, but one day something caught my eye. Did this gas meter suddenly become beautiful or interesting? Or was it always interesting but I had failed to see it before? According to Denis Dutton in his TED Talk "A Darwinian Theory of Beauty," he suggests that "beauty is an adaptive effect which we extend and intensify in the creation and enjoyment of works of art and entertainment." How about these other boring or ugly scenes? What would happen if, instead of walking up to a sketching location and pacing for a half hour (in search of the perfect subject to sketch), we just closed our eyes, spun around and sketched the first thing we saw when we opened our eyes? Regardless of its beauty or ugliness you have to sketch it. Imagine how that soiled plastic bag and paper coffee cup sitting in that murky puddle will look as a sketch by you? I would love to see the "swan" that comes out of your "ugly duckling." The Ugly Duckling" (Danish: Den grimme ælling) is a literary fairy tale by Danish poet and author Hans Christian Andersen (1805 – 1875). The story tells of a homely little bird born in a barnyard who suffers abuse from the others around him until, much to his delight (and to the surprise of others), he matures into a beautiful swan, the most beautiful bird of all.